boiled egg yolk (problematic and messy, I know) but it did seem to give the BGK a boost. Do you think it would be prudent to treat him with Prazi Pro? I thought that if its going to be tough getting food into him that I want to be sure he's getting everything from what he does eat. Hi there, have read over a lot of your Q&A but none of the questions really answer what I am experiencing. I have a cobalt Gourami, blue ram, gold ram, Cardinal tetras (12), two Kuhli loaches and a BGK. using flakes to distract the greedy fish the dropping in blood worms that sink to the bottom for the BGK and loaches but the greedy fish just manage to eat it all before the others get a chance. How can I make sure all my fish are getting fed properly? Any help would be good help. Thanks for taking the time. Jack. My question is, my Gourami, blue ram and tetras are quite greedy at feeding time and I've noticed my loaches and ghost knife (and also my gold ram who is new to the tank) don't really get any food. I've switched the food up using flakes to distract the greedy fish the dropping in blood worms that sink to the bottom for the BGK and loaches but the greedy fish just manage to eat it all before the others get a chance. How can I make sure all my fish are getting fed properly? they're feeding on insect larvae, crustaceans, and occasionally very, very small fish. They need a suitable mix of live and/or frozen foods (not freeze dried and certainly not flake) to survive, and like a lot of these electric fish, they're actually quite heavy feeders, prone to starvation if under-fed. Frozen bloodworms make a good food for enticing them after purchase, and live Tubifex are even better for stubborn non-feeders though they're risky because of where they're collected. You can also try live brine shrimp and live daphnia, or Spirulina-enriched frozen brine shrimps. Thank you so much for all the great advice and information. A few months ago I moved, and this house has a small pond (no fish, just dirty water), and after reading your advice, I thought of the pond. I grabbed a net and began swiping the pond and I had no idea I was sitting on a huge culture of bloodworms or some other type of red aquatic worm. So, I moved her into a 10gal alone to make sure she had no competition for the food. But, I ran into another issue. In the 10gal I had 2 Platies that were in quarantine for 2 weeks before I had to move them out to make room for the BGK. Well, one of the Platies had Ich and the BGK got it. So, I just moved the BGK into the main tank to treat one tank and just take apart the other. I followed the advice given to another about Ich and raised the temperature to 86F/30C for 2 weeks. The BGK had it really bad, she would constantly be scratching herself and had many spots on both sides. The heat method works perfectly, she lost all spots within a week, and seemed normal. Well, a few days ago I had to euthanize a Platy because it had developed dropsy (Did not catch it in time).Then, the next day, I found what looks like an Ich spot on another Platy. It seems that the BGK is stressing them out at night, which is a huge change, I guess they love to bug their smaller tank mates when healthy. So, I moved all Platies to the quarantine tank. From what I have read, if one fish has Ich, the tank has it too. The BGk shows no signs of white spots nor do the Danios and Otos I have. I just finished the high temperature treatment a week ago, would it be safe to slowly raise it again to 86F? Sorry for the bad pictures, but there she is eating a pellet, and thank you so much for the great advice and help in saving this fish! perfectly, she lost all spots within a week, and seemed normal. Well, a few days ago I had to euthanize a Platy because it had developed dropsy (Did not catch it in time).Then, the next day, I found what looks like an Ich spot on another Platy. It seems that the BGK is stressing them out at night, which is a huge change, I guess they love to bug their smaller tank mates when healthy. So, I moved all Platies to the quarantine tank. From what I have read, if one fish has Ich, the tank has it too. The BGK shows no signs of white spots nor do the Danios and Otos I have. I just finished the high temperature treatment a week ago, would it be safe to slowly raise it again to 86F? I have slowly raised from 79F to 82F in 2 days, but am unsure if it's dangerous or necessary to subject the tank to high temperatures again. <The high temperature isn't ideal for Platies or Black Ghosts as a permanent situation, but short term, shouldn't be a problem. Just double check there's plenty of oxygen. Supplemental aeration may be necessary. I've got a South American tank and, being a fanatic, I don't want to introduce anything outside of a S.American habitant. I've also got a snail problem. Will a BKG forage and eat the small live snails? <Nope. Certainly not the Melanoides type snails that can become a pest. Everything I've researched seems to hint at this, but I haven't found a definitive reference. <Apteronotus are specialist micropredators. They consume insect larvae more than anything else, though probably take other small animals occasionally. First off, I love how informative your site is for someone new to the hobby, thank you so much! Now, I have a 3-4inch BGK that I have had for almost a month in a 20gal long with five zebra danios and one Nerite snail. I am slowly preparing a 125gal tank that should be up and running mid February, which will have the BGK, a Senegal bichir and blood red parrot. <The Blood Parrot has been bred to have an odd shape some find pleasing. I discovered that my BGK did not eat in the mornings, so I started feeding her more at night. My concern is that I am not sure that she is eating much. I have seen her eat frozen bloodworms a couple of times, but she seems to ignore the meaty foods and will just make holes in my plants and chew on the stems. Every other fish dashes straight to the food, but my BGK seems to not care at all. I do see her poop, so I know she is eating something. Also, since BGK's are nocturnal, how would one go about checking on fish' well being without having the same amount of visual light and time? I started feeding the BGK at night, when I would see her out, and it seemed like she ate and was growing. Now, for the past 3 days, she wasn't coming out when the lights were turned off, which was something she did before. Today, I turned the lights on and the BGK was laying on its side on the gravel and did not swim to her regular hiding spot under a piece of driftwood. The BGK looked much smaller or thinner than before, it seems. Her color, fins etc look perfectly healthy, she has no spots, no visible injuries. She did not move when the light came on nor did she move when other fish would bump her. She finally moved when I gently touched her with my net. I have tried live mealworms, frozen bloodworms/brine shrimp, live earthworms, pellets and flakes. I do water changes every Wednesday (20% change) and Saturday (40-50% change) and all other fish seem very happy. I test my water with API freshwater liquid test kit twice a day(morning and night), and do two water changes a week to keep nitrates under 10ppm at all times. The only change I have noticed in my tank are the danios becoming more aggressive towards each other, one of them even had a chunk taken out of his belly. Thanks for the quick response, Neale! I had 6 danios, but the one that was being picked on by the all the other danios passed away. They do not harass the other fish, but they do chase each other around. Would chopping the meal worms count as live food or does it need to be alive while the BGK eats it? I have been observing the BGK all morning since she is sleeping out in the open, I tried moving her driftwood to cover her from the light, but a few minutes later she moved right back in full view and light. So, I moved my strip of light to one side, keeping her side much darker to help her feel comfortable. I think I will try my baby monitor that has night vision in order to see if the BGK is actually eating and coming out at night. From the picture I sent, does she look thin? <Hard to say. But unless you're providing ample small live foods, and once settled, frozen alternatives, your specimen will be unlikely to thrive. Are they too big for him to eat?! He's only small still, around 10cm long and I've had him for around 18 months. I'm not sure if this is just natural behaviour and he will eat them later so I should leave them be? Or if I should remove them as he probably won't eat them? and the linked files above. The live fish as food... too expensive, inconvenient; introducer of disease... and promoter of this poor behavior. This may be a silly question, sorry if it is... Just not 100% sure on this one, this is certainly odd behaviour for him. Any help would be hugely appreciated. 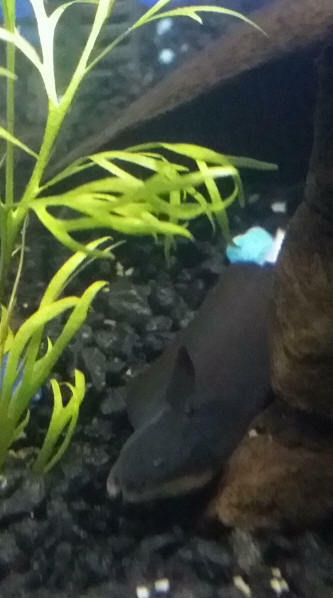 I have a black ghost knife fish that is eating my live plants! He really likes my ruffle lace plant, and I'm concerned as I though they were just carnivorous fish. Is it safe for them to eat plants? Or am I not feeding him enough? Currently he gets fed half a frozen blood worm or brine shrimp cube every day or a Tubifex worm cube. I also see him steal some flake food when I feed the other fish in the tank. He's small only about 2-3" long and I've had him about 1.5 months. He seems fine I'm just concerned as this is my second attempt at keeping this species and I want to be sure he's happy and healthy. I read all your FAQs, but still I have one unanswered question, Why my Black Ghost Knife Fish don't eat dried bloodworms? I am a newbie when it comes to aquarium. had a bad Ich patch with my fish tank and lost fishes, could not identify it as they were all white in color, my BGK got it very late hence I would identify that this is Ich, this is the only fish I have now n don't wanna loose him. *Ich cure I took*: when the tank had Ich, I removed fish in separate water (again was kept aside 24 hrs earlier), cleaned the whole tank. Kept the fish aside for 24 hrs. Then shifted it to fish tank by using 50% water (which I had kept it aside 24hrs earlier) and the 50% of water where fish was kept. Used blue color liquid in water which my local shopkeeper gave (I guess its Methylene blue) along with water conditioner. Used heater to raise the temp to 86F and added salt. The Ich is not that visible in fishs body but it tried to rub the body against the transparent tubes and PVC pipe I have kept in the tank hence I assume that Ich is still there. Its been 3 days now I have raised a temp hence would continue for few more days. (As I read that we should treat Ich at least a week). *Water change:* I change 1/4th water every day by turning off the heater with new water which I have kept it aside for 3-4 days before using it. I use small pipe to remove the water and dirt if any and pour the new water gently so as my fish will not be disturbed. *Today water condition:* The water looks clear but if I see it across carefully, I see some thread like stuff flying all over when I start my filter. Donno what it is hence I use the Aquarium Fish Catcher Net to remove it to my best. *Smell of Water:* Water does not smell bad. *Aquarium size :* 2ft length X 1ft height. 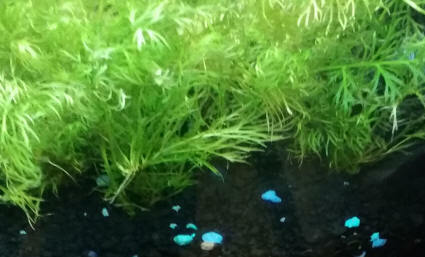 *Filtration:* I have bio sponge filter which is always on except in night time. Have one Hydro-Sponge ProFilter, one internal filter which I keep on for 15 min.s a day. *Decor:* No gravels, no larger stones or decor. I had one but the fish got hurt by rubbing against it so removed it. I have now two transparent tubes and one PVC Tube. And two small plants attached to small stones with plastic band. *Lights:* I keep aquarium lights off as I read that it will less stress the fish. I often cover the fish tank with the cloth also sometime. *Food:* earlier I tried flake food, but realize that my BGK does not eat it hence got dried bloodworms. Since they float in water, I tried to hand feed fish but no use. Then I soak them separately in aquarium water only and tried to put them near the fish in the night time hoping in morning fish will eat. But they were simply lying around the tank in morning. I cleaned them in morning. I keep food overnight to fish and clean it in morning. *Behavior of Fish :* The fish almost spend the entire day sleeping in tubes without moving. When I start the internal filter, it moves but that's it. Fishs fin is straight and not attached to the body. It does take a round around the tank once we switch off all the lights, but again the same old story. What am I doing wrong? Why my fish don't eat? Its been almost 2 weeks now I have had him and the Ich bad patch was there last week, the exact cure I started 3 days back. Sorry to bother you with the same old questions may be, but I would appreciate if you can reply me as I have no clue whats wrong and how long will my BGK survive? Thanks a lot Bob for such a fast reply and all kind help. i would now leave all filters on continuously. I will buy some live bloodworms today and would feed him just after turning off the light. ...........will that means i have to keep the live bloodworms away from his current location?, he usually rest in PVC tube ...so may be away from it? http://www.wetwebmedia.com/FWSubWebIndex/bgkfdg.htm , said "he usually missed everything that doesn't drift about 1/8th of an inch in front of him,"
Thanks once again for wonderful help. am so happy to see him eating .... am sure now he would be fine and will survive. Hello Neale, I have finally been able to feed to black ghost knife on frozen bloodworms! As I was rifling though a kitchen drawer, I found a needle-less syringe, able to hold maybe half a glass of water at a time. quick question: I've recently been feeding my silver dollars peas (the Ctenopoma tries them too), and was wondering how often I should give them some? Also, I'm purchasing a Butterfly fish soon, and bought "cichlid staple" meant for Oscars and such. They float, and I assume they are relatively nutritious... Along with frozen bloodworms, frozen brine shrimp, and the small flies you recommended, would I be able to feed these to it? <Yes; indeed, once the Butterflyfish is settled, it is very wise to make good quality floating foods (like Hikari Cichlid Gold) the staple food.